The alien languages in Futurama are set of background jokes, appearing in the background through out the length of the show. The intention of these alien languages was for its viewers to discover how they work and then decipher them, feats at which its fanbase have excelled. Technically, they are not 'languages' per se, but a ciphered form of English, or more precisely, Latin characters, since not all of their 'translations' are in English. There are only two of these 'languages' known to exist, or at least deciphered. Some fans believe a 3rd language was introduced in the fourth season, but this has been confirmed to be false. For a list of sightings, see list of alien language sightings. The first alien language (Alien Language 1; AL1) is a simple substitution cypher. This means that each Latin letter is simply replaced with a new symbol. 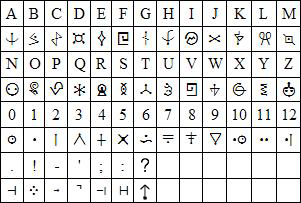 The script can be translated into English simply by learning each symbol, or by looking it up in a table. In the episode "Leela's Homeworld", the script is referred to as "Alienese". The second alien language is more complicated, a variation of the classic autokey cipher, and is not for the faint of heart. Each symbol has a numerical value. To decode a message, the first symbol's value is translated directly into a character (0='A', 1='B', and so on). For the remaining letters, you subtract the previous symbol's numerical value. If the result is less than zero, you add 26. Then that number is converted into a character as before. 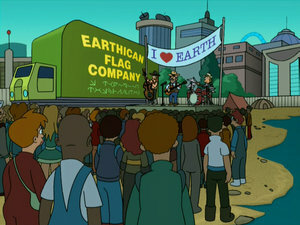 Not until the release of Bender's Big Score was the symbol 1 ("B") known. It was not used in the movie, but was released as part of a special feature on the DVD called "Bite My Shiny Metal X", a special lecture discussing the math of Futurama. Note: If you ever see two identical symbols in a row, the second is always an "A". 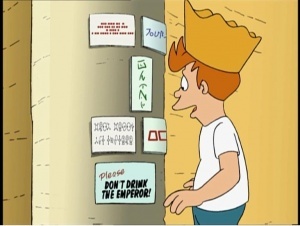 In the commentary for "The Why of Fry", David X. Cohen refers to the AL2 on the obelisks on Planet Eternium as "the Nibblonians' language". Various Alien Language symbols. The highest one up (in red) is Morse Code. 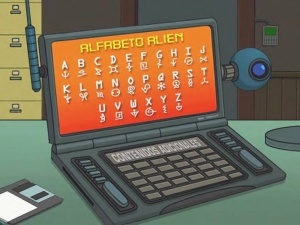 If two Alien Languages aren't enough, the Futurama writers have also done other Alien Languages that seem to be Gibberish, and have not been translated, like Leela's bracelet under her Wristlojackimator, various symbols in "My Three Suns" and others. Many fans think that AL1 is Alienese and AL2 is Betacrypt 3. Although Alienese is used to refer to AL1 in "Leela's Homeworld", Betacrypt 3 is never actually linked to either AL1 or AL2. Throughout the audio commentaries, the creators refer to each language as "Alien Language one" and "Alien Language two"—so we use the same standard here. In "Leela's Homeworld", the Professor says that Alienese can be translated into "Betacrypt 3, a language so complex there's *even less* chance of understanding it", possibly referring to AL2. In the commentary for "A Bicyclops Built for Two", David X. Cohen makes note of some fans referring to AL2 as Betacrypt 3. It is seen on a door to a chat room. AL1 makes an appearance in The Simpsons in the episode "Beware My Cheating Bart" while Homer is watching Stranded, a spoof on the show Lost. The Alienese is printed on a rock and says "Watch Futurama Thursdays at 10". Alien Language Translations--A site with excellent alien language translations for each episode and other Futurama-related media. Alienese Decoder WebApp--A webapp to translate to and from Alienese. Alienese Decoder Android App--An Android app to translate to and from Alienese. E.T. Languages & Non-Human Origins--A site discussing actual, real-world alien languages. ^ Ashik Siddique (15 November 2013). No TV Show Has Ever Loved Math as Much as Futurama | Underwire. (Wired.com.) Retrieved on 15 November 2013. This page was last edited on 8 November 2015, at 22:02.